Pachinko is like a completely luck-based pinball machine minus the flippers, but with a few buckets thrown in to the mix instead. Note: if you’ve ever watched Play Your Cards Right, it’s a lot like Plinko. Apparently, Pachinko is all the rage in Japan. It’s one of the limited forms of gambling available to the Japanese people, which explains why it’s so popular. I’d imagine that Pachinko machines in Japan are about as common as the fruit machines we have in the UK. So aside from Sushi and an abundance of electrical goods, it looks like we’ve got something else to thank the Japanese for. Thankfully, Pachinko makes an impressive transition in to the world of online games. The balls and the machine could act a little more realistically from a Physics perspective, but overall it’s enjoyable to watch the balls bounce around and toward the money-making buckets. The best part about the whole game is the fact that Pachinko is amazingly good fun to watch. There is very little in terms of interaction, but that’s the way a Pachinko machine is meant to play, so I can’t really complain there. Pachinko is a very unique and enjoyable game (not to mention addictive), which means that the fun rating of 82% is thoroughly deserved. I’d highly recommend checking online Pachinko out, as I’m sure that you haven’t played anything else quite like it. Choose the number of balls you want to play with and how much you want to wager on each ball. Release the balls in to the Pachinko machine and hope that they land in the buckets. Collect your winnings or continue with the balls equivalent of your earnings at the end of each round. The game in more detail. If you’ve ever seen The Price Is Right, Pachinko is a lot like Plinko. 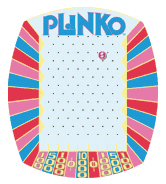 I guess that’s why Plinko sounds so similar to Pachinko. But anyway, balls are fired up in to the Pachinko machine and fall through it thanks to gravity. As the balls fall, they can hit pins, bumpers and turbines on their way down, altering their path as they go. Scattered throughout the Pachinko machine are small buckets. If a balls lands in one of these you win money according to the bucket’s win multiplier. The win multiplier varies depending on the round in the game and how difficult it is to land a ball in that particular bucket. 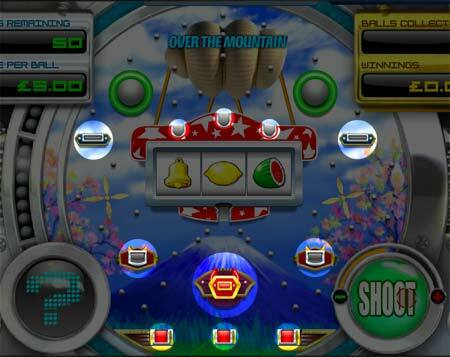 There are a maximum of 8 rounds in one game of online Pachinko. Winnings can be collected or rolled over on to the next round. The win multipliers of buckets generally increase from one round to the next. Therefore, rounds become progressively more valuable. The round is over after all of the balls have fallen through the Pachinko machine. You can choose to collect or continue at the end of each round. As you progress through the game, each round will become more valuable than the next. The buckets provide greater win multipliers, which means that you can win much more money as you go along. However, with every round you play you run the risk of losing all your balls without winning or winning very little, so continuing (instead of collecting) is a calculated risk. 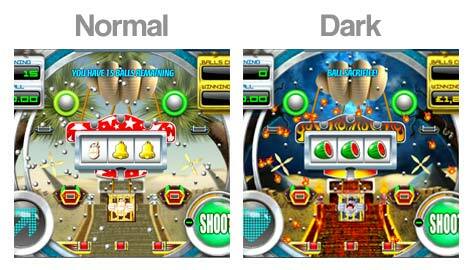 Every other round in Pachinko online is called a "dark round", and they are simply "evil" versions of the previous round. In these dark rounds, the buckets are worth much more and the standard steel balls are replaced with fiery balls. In genereal, you should expect to see a bigger payout from dark rounds over the standard rounds. The likelihood of balls falling in to buckets is exactly the same for both types of rounds, the only difference is the dark rounds tend to provide much bigger wins if you get lucky. Note: If the next round is a "dark round" it’s almost always worth your while to play it. Along with the buckets, there is a mini slot machine in the centre of the Pachinko machine with 3 holes in the top. If a ball lands in any of these holes it will set the slot reels in motion. The payouts for the mini slot vary and increase from one round to the next. The featured symbol also changes as you progress from round 1 up to round 8. 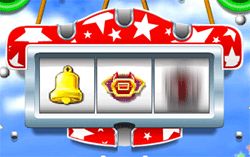 Gorilla, Panda and Merry-Go-Round slot symbols. If you are lucky enough to get 3 featured symbols on the mini slot you will activate the featured Gorilla, Panda or Merry-Go-Round depending on which round you are playing at the time. Once any one of these has been activated it will become receptive to balls. If a ball enters the Gorilla, Panda or Merry-Go-Round it will result in much bigger wins. These have the biggest multipliers out of all of the buckets in the machine. Pachinko has a handy auto-shoot function. If this is turned on, the balls will automatically be fired in to the machine one after another on your behalf. You can also control the rate of fire using the auto shoot control bar. If you have few balls in play, it’s more fun to shoot each ball manually. However, if you have 20+ balls in the game, it will be worth your while to make use of the auto shoot function to speed things up (and save that clicking finger from exhaustion). As mentioned, the payouts for the buckets and mini slot increase and vary as you progress through the game. The payout tables can be found by clicking the "PAYTABLE" button in the bottom-left corner of the Pachinko game window. Choose carefully when selecting whether to continue or collect your winnings. Don’t fall in to the trap of feeling compelled to play through all 8 rounds. If you like the look of your current winnings, collect them and move on. Firing the balls in to the machine slowly can be beneficial. 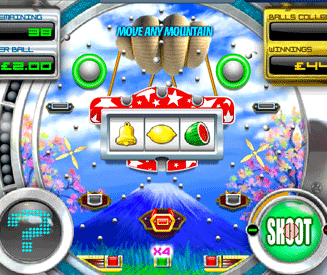 If you fire the balls rapidly, a lot of balls will travel through the machine whilst the mini slot reels spin. If the feature is unlocked, you will have lost the opportunity for these balls to fall in to the recently opened Gorilla, Panda or Merry-Go-Round. Aside from these two quick tips, good luck!